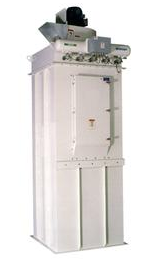 The VSD series of bin vent pulse jet filters is an excellent method to vent silos being filled by pneumatic systems or from bulk trucks. The units are available in two styles and are often equipped with the optional integral direct drive blower. The blower will provide vacuum for silos that may not be sealed. Applications include feed, ingredients, flour, chemicals, and cement.